This book is the final of a series of four written over a period of 10 years and the result of an East-West collaborative effort by scholars who study the psychology contained in Buddhism. These volumes draw on what Maurits has coined Buddhism 4.0, a secular and psychological approach to Buddhism which respects and honors the vast groundwork of the Dharma and its complex developments. Buddhism 4.0 lays the foundation for Buddhist psychology/therapy, counseling, and coaching by providing a demystified, non-metaphysical, and salubrious practice toward meaningful life-fulfillment. The present volume highlights and explains the rich heritage of Buddhist thought by offering a mosaic of main themes in a compact way. It narrates Gautama’s life from a clinical psychological perspective, illuminates pan-Buddhist core components against the backdrop of Ancient Greek Buddhism, and articulates known and lesser known past and recent data of Buddhism in a healing framework. It thereby touches Social Constructionism and Rational Emotive Behavior Therapy, and structures traditional Buddhism in a Western context while elucidating this important adjustment for a 21st century world. Finally, it delivers hands-on meditation exercises as a modus vivendi rather than as a quick fix to end emotional suffering. Pristine mindfulness, heartfulness, breathing and sensing meditations, contemplations on death, loving-kindness and compassion, and smiling/singing exercises are included. 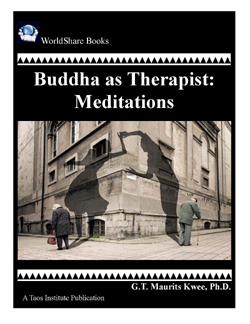 Buddha as Therapist: Meditations is a concise roadmap providing framework, insight, and understanding with regard to the Buddha as the first psychologist ever and to his psychology which is ready to be used in everyday life.